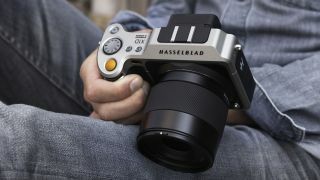 Medium format camera specialist Hasselblad has today announced a ‘Rent a Hasselblad’ global online service. The new service allows photographers to use the company's famously expensive gear for a fraction of the retail price. The company is launching it with the Hasselblad X1D-50c, a camera that would usually set you back around £8000/$9000 for its body alone. Renting it through the news service, however, would instead cost around $110 – around £83 per day. The Hasselblad X1D made waves on announcement for packing an impressive spec sheet into a body that weighs just 825g with its battery and card in place. Like the Fujifilm GFX-50S it eschews a mirror and built-in viewfinder, and offers a selection of welcome features you might not expect from a medium format camera, such as a 1/2000sec flash-sync speed, a touch-sensitive LCD screen, built-in Wi-Fi, dual card slots and even microphone and headphone ports for video. A selection of compatible lenses are also available on the rental service. These include the XCD 90mm f/3.2 lens, which is available for $32 per day (about £24), and the XCD 45mm f/3.5, which you can try out for $27 per day (about £20). As a further bonus, Hasselblad has said that these rental charges can also be put towards purchases, should the trial impress users enough to jump into the system. So, if a day with X1D-50c is enough to convince you to drop £8,000 on it, you can go ahead and knock off £80, the only caveat being that you have to make the commitment within 14 days of the rental. "Owning a Hasselblad medium format camera system is a significant investment even for a successful high-paid photographer," said Bronius Rudnickas, Hasselblad's Marketing Manager. "Consequently, many professional photographers and enthusiasts haven’t had the opportunity to see what they’re able to create with Hasselblad’s medium format technology. The ‘Rent a Hasselblad’ program is designed to change that and we’re looking forward to seeing what photographers are able to produce having easier access to our photographic tools." While the company has only included the X1D-50c body and compatible lenses in the service for the time being, the firm has promised that a greater range of products will will become available in the future. The new service is now available at more than 40 locations worldwide, although Hasselblad says it's expecting this figure to increase. For further details and pricing information, head over to Hasselblad's website.